While other kids her age may be glued to their phones, obsessed with video games, or stuck on social media, your child adores time spent outside under the sun. Phew! What a ray of light. After school, they can often be found fiddling around in the garden, planting, harvesting, and even weeding! Your kiddo loves to get their hands dirty and work hard, and they simply adore seeing the fruits of their labor come to life—fresh vegetables on their dinner plate or a vase of fresh-cut flowers on the kitchen table. Why not turn Halloween into a chance for them to show off their green thumb? They can parade around as their fave bloom as they enjoy the school costume party or an evening of trick-or-treating! Your kid is far from ordinary; encourage them to be their brightest and most cheerful self this holiday and watch their joy blossom! Made by Us in our exclusive costume studio, this Flower Pot Kid's Costume was crafted with the utmost attention to detail and was tended to under the watchful eye of our design team. It's a clever ensemble that involves a simple trick of the eye and lots of your girl's bright energy. The foam, faux terra cotta flower pot has wire in the upper and lower edges to keep its shape, as well as fabric suspenders that can tie at the shoulders. Your kiddo will wear it over their fave black leggings and tee, and then you'll pick up the headpiece and sunglasses separately. What an awesome little blossom! Who knows? 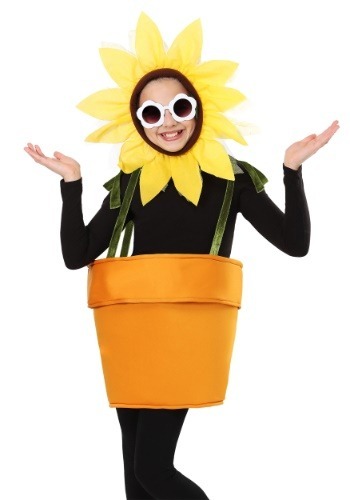 This amazing costume may even inspire your child to start a gardening club at school! In this unique costume, she'll be a breath of fresh air against a classroom of goblins, ghouls, and ghosts. We can't wait to see how her green thumb grows as she does.